Salads are typically a great food option to satisfy hunger cravings without overeating too much. Throw in some chicken and some tortillas and you can add a fresh spin on a food staple. Here is what you’ll need. Begin by preheating your oven to 450 degrees. Using a small bowl, mix the pizza sauce and salsa together. 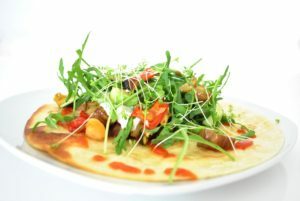 Use about ¼ cup of the sauce mixture on the tortilla, making sure to spread it around. Follow by spreading half a cup of the chicken on the tortilla. Once you’re done, place the tortilla(s) in the oven and allow it to heat to a crisp, it should take about five minutes or so. While the tortillas are heating, mix the red onion and salad greens together. If you like, add any additional ingredients to the greens. Use a separate bowl to whisk the zest, olive oil, and lime juice together. Use the salt and pepper for taste. Toss the salad greens you prepared in the vinaigrette and then use a handful to pour over the chicken tortillas once they’re ready. Repeat the step for all six tortillas. This update or recipe is provided by tortilla company Easy Foods Incorporated. Our wholesale tortillas products include corn tortillas, flour tortillas, tortilla chips, and wraps. For more information on our services or brands like Tacomex and Vedgee or private label tortillas, please call 305-928-1593. Our business hours are 9 am to 5 pm Monday through Friday Eastern time and we are closed on weekends.